let denote the outcome of rolling any die. The possible outcomes are . let denote whether the die is fair or not. The possible outcomes are . let denote the number of consecutive times a “five” is observed after rolling a die. The possible outcomes are all non-negative integers. and this is the premise of the question. applying the law of total probability. Now, re-write the joint probability in the numerator by applying the definition of conditional probability again, but reversing the conditionality. By Equation , set 0.5 to be less than the above equation. To solve the problem, we need to find the minimum value of such that Inequality is true. This inequality cannot be solved analytically, so I computed the right-hand side of for various possible values of in R. Below is the resulting plot. Many functions were used to generate it. I encourage you to study the code carefully to learn all of the useful functions and build your own plot with custom axes, tick marks, and tick labels. Notice that I needed to use the axis() function twice to add all of the tick marks that I wanted. For some reason, I could not add ‘0’ and ‘1’ among the first set of tick marks, but I could add them separately in a second calling of axis(). I also found a document by Tian Zheng from Columbia University that lists the names of various colours in R. It turns out that there are many more colours than the standard ones that I usually use from the colours of a rainbow! 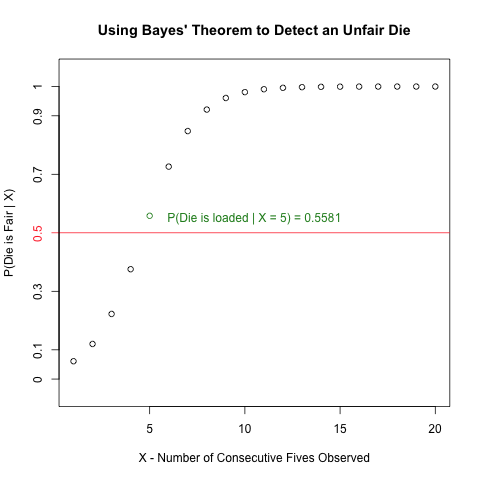 As the plot shows, if you see 5 or more consecutive “fives”, you have reason to suspect that the die is unfair. # calculate the probability of the die being unfair given the observed number of consecutive "fives"
Durbin, R. (Ed.). (1998). Biological sequence analysis: probabilistic models of proteins and nucleic acids. Cambridge university press.